This is a chair everyone with a printer and some nGen_FLEX filament can make at home! 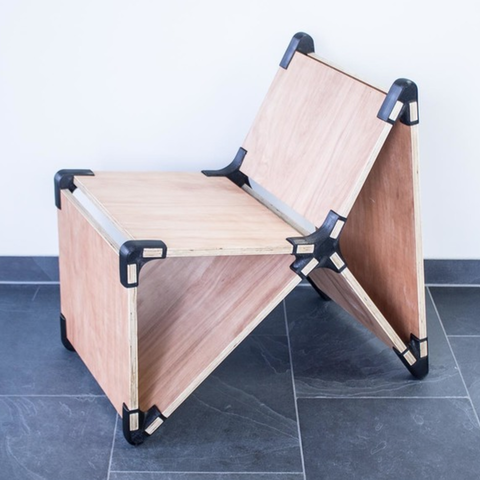 Using the printed parts in combination with plywood you can buy at any hardware store it becomes possible to make this chair yourself. With some CAD skills you can customize it yourself to make the chair more ergonomic, or even customize it to a complete new version! We have printed the parts with nGen_FLEX on a Ultimaker 2+ with a 0.8 nozzle, 30% infill and a brim of at least 10 perimeters. The printer does require proper bed adhesion materials such as LokBuild (which we used) or BuildTak. 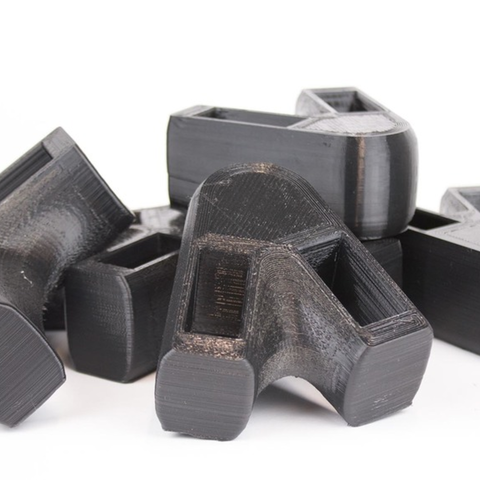 To ensure enough strength and flexibility, we have printed each part with 7 perimeters and a 0,8 millimeter layer width on a resolution of 0.2 millimeters. The printed parts are stronger this way since they make use of the print direction. Print slow to ensure proper layer adhesion and cooling for the overhangs. It is possible to print them with support, but the surface quality does not differ that much from printing without supports. Slow printing will also help to prevent complete warping of the parts, which will happen during the printing process. If it is possible, try to enclose the printer from the front to make sure that the surrounding temperature does not impact the print. Also it is advised to "mirror" the connectors for the other side of the chair in order to have a matching finish on the printed parts. After printing only the brim has to be removed, together with possible excess material depending on your retraction settings. Every component also has to be checked on the amount of warping, since the parts will warp due to the properties of nGen_FLEX. To make the chair you need some 18 millimeter thick plywood which you can buy at almost any hardware store or wood shop. Other materials might also work but we only tested with plywood. Afterwards the marking tool included in the files was printed in PLA with standard settings and used to mark the gaps in the wood that needed to be cut. The tool works by placing it on a corner of a panel, and is designed to be used for all corners. For reference to the correct geometry we included the technical drawings in the files. The tool has taken pencil or pen width into account, and it is advised to cut on the inside of the line in order to get the final geometry to the proper size using other tools or sandpaper. We then used a higher grade sandpaper to make the wood more smooth and used standard wood oil to protect the surface. This will make it a bit darker and let the grain come out more. We have also provided DXF files for the panels for when laser cutting is an available option. For the assembly we have provided an assembly manual. The assembly has been done using a small hammer to set the printed pieces into place. Since it is nGen_FLEX, it can take a hit and the flexibility will make sure it fits perfectly around the wood. It is advised to assemble it with two people, so it can be done quickly and without any problems. This design has been made to make people use their printers and colorFabb materials for actual functional products, and to let others that are not familiar with 3D printing see what is possible. 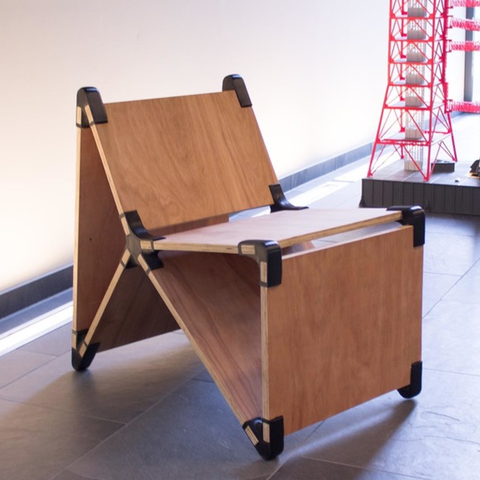 The chair has been engineered to support a maximum load of 150 kilograms, but a lower load is of course preferable. 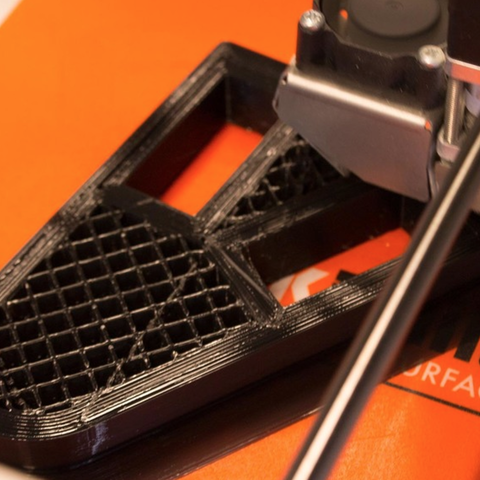 The printed parts itself are designed with a safety factor that resulted from active testing of the material. Since we tried to use the material as efficient as possible the all parts can be printed with 3 spools of nGen_FLEX filament. This does not however take into account possbile failed prints, and therefore a backup spool might be necessary. For more information on the material please visit the designated web page. No further testing was done regarding safety and/or durability. Therefore we can not take or accept any responsibility for anything a user does (prints) with the filament.